Where is the best place in South East Asia to buy electronics? Where's the cheapest place to buy electronics in South East Asia? Singapore, Kuala Lumpur, and Bangkok are all huge travel hubs. All, along with Hong Kong, have a reputation for great deals on cameras, computers and electronic equipment. Which destination is cheaper? Which has the best selection? And which is easier to shop around in? I shopped in all, and this is what I found out. All prices are shown in USD$ for the sake of ease. And prices are based on new items both recently released, and older stock based on late 2011 rates. I stuck with cameras and lenses I was interested in. The same high end Sony Vaio laptop and mid range Samsung phone at the time to try and give accurate price fluctuations. Keep in mind that no matter the year or item, this should still give you a good indication of where to buy what at the best prices! Where to buy cameras, lenses and laptops in Singapore? 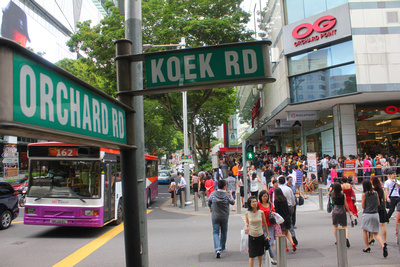 There is a collection of stores near the City Hall MRT station. Cathay Photo (111 North Bridge Road) have several outlets throughout Singapore. This is one of the bigger ones with plenty of stock. Both places are clean and the staff knowledgeable. If I were to suggest one, I'd head to The Camera Workshop. Near here is the Fuman Digitalife Mall, which also have several laptop / computer stores. I wouldn't get too excited. Sim Lim Square is noted for having one of those floor upon floor malls packed with electronics. Easy shopping here. Cost of cameras, lenses and laptops in Singapore? ** Note: This lens was only just released when I visited Singapore, and at that time, it was the only place I could find it. In other words, it took Kuala Lumpur, and Bangkok stores quite a while (months) to get stocks in. Note: same laptop was used for pricing in all three cities. I can't say I came up against the whole "what's your best price" thing here. People were fairly straight with their prices, even in the second hand camera market. In regards to the computer / laptop market I found better prices easier to bargain for. 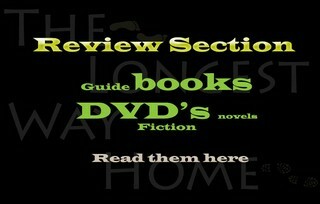 With many prices dropping by $100 with bags, or external DVD writers thrown in. For cameras I personally did not find any fake cameras. I did see some seriously reconditioned lenses. And, heard some horror stories about them. There were plenty of homemade laptops and computers available, I would stay clear of them! Best electronics to buy in Singapore? New electronics. Though the range is not huge, the latest and greatest electronics are available pretty much after they are released here. Second hand camera equipment. Though I am not a fan of second hand camera equipment, of all city locations covered here Singapore offered the biggest range, and the better prices. Where to buy cameras, lenses and laptops in Kuala Lumpur, Malaysia? Sungai Wang Plaza (Jalan Bukit Bintang, Kuala Lumpur) and Low Yat Plaza (No. 7 Jalan Bukit Bintang, Kuala Lumpur) are huge multi-story buildings very close to each other filled with electronic gadgets. And they are all close to the Monorail. The buildings are clean, and well laid out. Some stores have prices displayed on items others don't. There is only one second hand camera store I can recommend in Kuala Lumpur and that is YL Cameras (1st Floor Pudu Plaza, Jalan Landak). Cost of cameras, lenses and laptops in Kuala Lumpur? Prices fluctuate too much to give exact quotes on specific models. There are also far too many to realistically list here. However, for the benefit of example I will give some rough indications on certain products based on USD. Cheapest average laptop (Acer, MTI) can be bought for $263 upwards. There are also higher spec machines available, and some much cheaper home made machines. 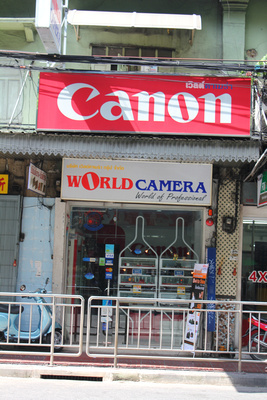 To give you an example of why you must bargain in Kuala Lumpur: a genuine Canon battery was offered to me for $115. You then simply ask "What's your best price?" If they say "Fixed price". Shrug your shoulders, laugh and move on. They'll call you back. Never settle for what the sticker says. This battery dropped by 50% in price. Again with Canon batteries. I also examined a "fake" battery with a starting price of $65. I bought it for $25 after bargaining. It's working just fine. Though I don't recommend you buy any fake goods for your own equipment. There have been cases of overheating batteries and bad connectors that can destroy your equipment. Use caution. Always check to see where the product was made. Many lenses are made in Japan but some cheaper lenses are appearing with "made in China" stamped onto them. Again, use caution. There have been tales of cameras and laptops with new casings and old parts inside. Use caution and try before you buy! An interesting note is that a few retailers in Kuala Lumpur would not let me test their L series (high end) Canon lenses. Stating they were too valuable. Holding out a wad of cash to show you are buying and not just playing breaks this rule. Best electronics to buy in Kuala Lumpur? 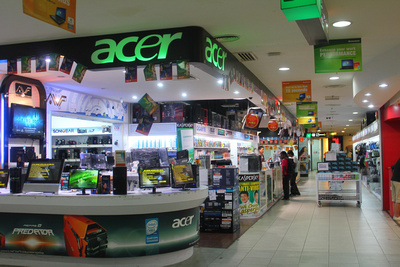 There's a huge range of laptops, tablets, cameras, lenses and electronics in Kuala Lumpur. They are not the latest and greatest creations. I found Bangkok and Singapore usually get the latest. However, I found portable hard drives to be a good 30% cheaper in Kuala Lumpur than in the other big cities. Moreover they have a larger range. 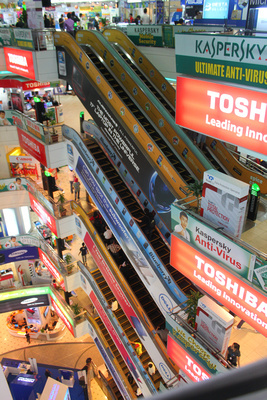 If you are spending time in Kuala Lumpur take note that there are often weekly sales on certain items in the big electronics stores on the top and penultimate floors of these stores that might be worth checking out! Where to buy cameras, lenses and laptops in Bangkok, Thailand? The big mega-malls of MBK (BTS National Stadium) and Paragon (BTS Siam) have mountains of selections. 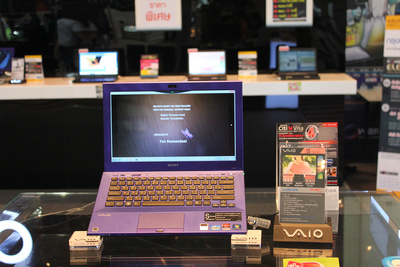 For an entire mall of laptops cameras and a smaller selection of phones head to Pantip Plaza, just near BTS Ratchathewi. There are several small camera stores dotted around Chinatown that are also worth checking out. Cost of cameras, lenses and laptops in Bangkok? Most people I spoke with said, "go to Pantip" when it came to prices. Personally I saw very little difference in the prices between Pantip and Paragon (upscale mall). What I did find was that the people in Pantip spoke better English and were far more into making a sale than in the other big electronic malls. Price wise for phones I found MBK's upper "phone" section to be about 500 bhat cheaper than elsewhere. However, I should point out that finding the right person is essential anywhere in these stores. English is not always the best and fast sales are often compulsory. Laptops and electronics in general I found a little pricey compared to Kuala Lumpur and Singapore. On average ranging from $50 to $100 more so in Bangkok. Also do note that laptops have English/Thai keys here. Operating systems often come in Thai though you can request an English (or relevant) language to be installed instead. When pushed all vendors admitted the alternative language operating systems they were offering were not genuine. Tablet computers are nearly all in English though language settings might be selected on Thai - just get the staff to change them to English or your preferred language. * HTC One pricing is fluctuating between Bangkok, Kuala Lumpur and Singapore due to aggressive promotions by HTC. At one stage Singapore was at least USD$50 cheaper however that seems to have evened out in late 2013 as promotions in Kuala Lumpur and Bangkok were introduced. It's worth trying everywhere. I found MBK and Pantip to be the most open to bargaining. While in Paragon instead of discounts you could ask for extras. If you speak Thai or have a Thai friend this all becomes much easier. Shopping around first to get an idea of prices is well worth the effort before you start bargaining. Best bargains resulted in freebie offers or extras thrown on. For example bargaining for a laptop could get you only a few hundred bhat discounted but ask for freebies like an external DVD or a case and you could get more bang for your buck than a discount. Yes they exist. Especially in the phone markets. Cheap China clones of iPhones are all over MBK. Likewise with many popular phone brands.Tell them you want an original and not a fake straight away to avoid hassles. Likewise try dressing smartly when you go shopping to buy. I noticed a difference in the quality of service between dressed to travel and dressed if possibly living in Bangkok. I bought a fake battery for my phone. Unlike the fake camera battery from Kuala Lumpur the fake phone battery lasted 2 weeks before giving terrible battery life. Best electronics to buy in Bangkok? This is a hard one. I'd say Bangkok is good for phones and general gadgets. Laptops are good here but the Thai keyboard puts me off a little. However tablets are nearly always in English. Again cameras and lenses are available en masse. However for best buys I'd stick with cheaper electronic gadgets and phones. You might notice a VAT or Tax back counter at the airport before you fly home and also at a store where you bought an item. There are a myriad of loopholes but you can claim back a little tax on some electronics. Usually you need to fill out several forms. The first is at the store you bought the item. They take half the form and process it for you. The other half you present to the VAT back counter at the airport before filling out one of their forms. If the electronics item is below a certain price, then you can get cash back immediately into your hand. If the item is over a certain price then it is deposited into the method of payment you used to buy the item. Usually your credit card. So be prepared to hand over your credit card details too. Tip: If buying from a store and hoping to get cash back make sure the store is relatively reputable. You won't get any money back for large amounts unless they process their half of the tax back form. Do note that if you are not flying out to your country of residence you may not get any tax back. Always ask what the international warranty is on the product you are buying. For many international branded products you might note that there is no international warranty. In other words buy a HTC phone in Thailand and if it breaks two weeks later in Malaysia then you'll need to go back to Thailand to get it repaired. There are exceptions. For example Sony have an international warranty. However it's only for one year. And if you buy a Sony laptop in Thailand and want to get it repaired in another country be prepared for a long wait as they have to order special parts for it. This is relative to the product, eg. a Thai keyboard. Camera's are also subject to various warranties. Canon have an international warranty that is quite good. Just be sure you don't buy a country specific camera like a Japanese version of the Rebel, and you may again have to wait a while to get it repaired. Tip: if warranty is a big issue for you make sure what you are buying abroad is also available in your home country. Yes you are not through yet. You arrive home only to have a person point you through to "Something to declare". They open your bag and see a shiny nice laptop box folded up neatly. Then ask you for receipts. Depending on the cost you may have to pay duty on it! How much you have to pay is dependant on your countries tax laws and the value of the item. Tip: Do you really need that nice new cardboard box your phone or laptop came with? Well if you ever plan to sell the item in the future after you have used it or want to upgrade then the box will always add on some value. If this is the case take out the foam padding, fold up the box and post it home in advance. In some countries a custom official may also accuse you of trying to sell the product you bought as a gift if they spot lots of packaging in your luggage. Another reason not to bring any packaging back with you. This is by no means a complete list. I just pieced together my findings based on some of the things I have an interest in. Electronics in South East Asia are not dramatically cheaper than the USA or Europe. In fact laptops are generally cheaper in the USA. Always ask about international warranty. In all these malls you can pay with a credit card, just don't let it out of your sight and ask about extra charges. Keep receipts. You might be eligible for tax back if flying out. Keep a written note on all prices and store names if shopping around. It will save you time and transport costs if you can just work out from a list who had the best price or deal for you. Generally speaking within the individual cities themselves there's not a huge difference in price for the same item. It's usually the extra add on's that change. 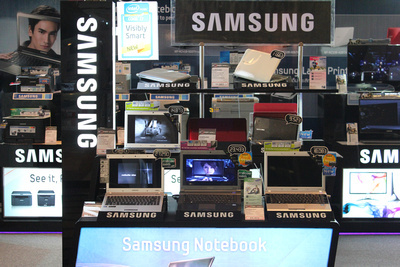 Singapore: for the latest gadgets and electronics equipment on the market. For second hand camera equipment. Kuala Lumpur: Laptops. Cameras, lenses (for prices), and portable hard drives. Bangkok: Phones. Cameras and lenses only for the huge selection available. More to come? I'll keep updating this list as I find new places. Meanwhile, if anyone would like to add their own findings, please leave a comment. I'm particularly interested in what people have found in Hong Kong! Where is the cheapest place to buy electronics in the world? Don't fret if you arrive home without buying that super electronics deal in South East Asia. The cheapest place to buy electronics in the world is probably the U.S.A. and probably through on online store like Amazon.com. If you are in Europe then store's like Amazon.co.uk are a better option as Amazon.com can't ship electronics internationally. The USA is a huge buyers market and like anything when buying in bulk things become cheaper. Add in online stores reduced costs, rebates etc and you may just find that buying online in the USA is the cheapest and best option for buying electronics. Alternatively please share this article! 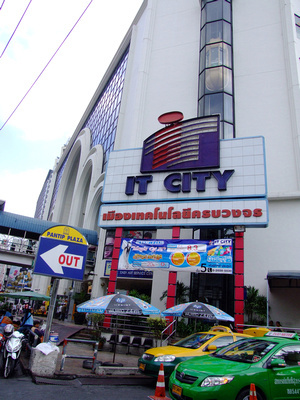 Bangkok's dedicated IT Mall - the higher you go up, the cheaper it gets! I want more information on becoming a member? Make sure the keyboard and software is in your language! 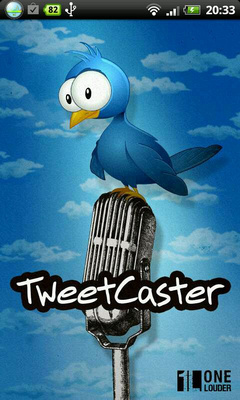 Check out my top Twitter app reviews! Did you find this page useful? Please spread the word!